Its impossible to live in Texas without having heard about the Battle of Gonzales. What many may not know is this battle’s Classical connection. First a refresher for those who may have forgotten. The Battle of Gonzales was a minor skirmish fought in 1835 between a detachment of cavalry from the Mexican Army and band of Texians from the city of Gonzales which lies about 70 miles east of San Antonio and 70 miles south of Austin. And yes “Texians” is spelled correctly. Texian (with an i) refers to citizens of Texas before it became a part of the United States, more specifically to people who supported Texas independence. The cause of the conflict was a cannon. In 1831, the Mexican army had issued a cannon to the people of Gonzales for protection against raids by Comanche Indians. As the idea of Texas Independence began to gain steam, the Mexican government no longer wished to have a part in providing equipment for a rebellion against its authority. So in late September/early October of 1835, the Mexican army sent a detachment of about 100 heavy cavalry (called Dragoons) to retrieve the cannon from the colonists. The Texians refused to give up the cannon. Brief gunfire was exchanged. The Mexican cavalry withdrew. And the War for Texas Independence had begun. Along with the cannon, came a flag emblazoned with the famous phrase: Come and Take It. The phrase has since been taken up by 2nd amendment defenders. But few remember its ancient origins. The phrase goes back to Ancient Greece and specifically to the battle of Thermopylae. In 480 BC, Xerxes led a massive Persian Army into Greece. The Persians advanced quickly allowing the Greeks little time to respond. The Greeks decided to send a token force of Spartans and other allies to a choke point along the coast road called Thermopylae, a narrow coastal pass with ocean on one side and mountains on the other. A small force could create a traffic jam and delay a larger force for some time. Reinserted into our cultural memory by the somewhat cartoonish movie “300”, and the more accurate and amazing historical fiction novel “The Gates of Fire” by Steven Pressfield, the battle symbolizes the valiant struggle of brave men facing a hopeless situation. 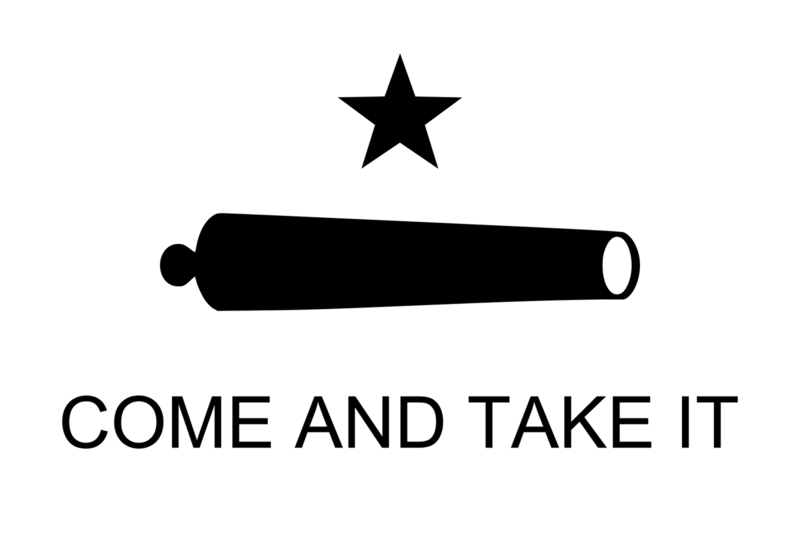 The Texian use of the phrase “Come and Take It” can been seen, therefore, as more than a provocative statement of defiance. It reveals that this small band of citizen militia understood their actions in the context of a larger struggle. They saw themselves, like the small band of Spartans, as resisting a larger tyrannical power and doing so on behalf of freedom and democracy. Though the battle resulted in few casualties, it reveals that these soldiers were prepared to risk a great deal to defend what they believed to be right. And it shows that a bunch of farmers and ranchers in 19th century Texas knew their Classical History…which is kinda cool.